Welcome to the Guess that Grape Contest! Think you got it? Leave a comment below with your answer – make sure you include your email address! 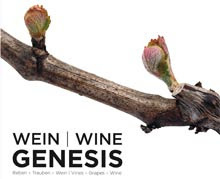 Correctly identifying all four will earn you a chance to win the Austrian Wine Genesis book, retailed at $90. The contest will run until July 21st. You will be alerted by email if you’ve won at that time. Brand Action Team employees are not allowed to enter.